I don’t think you know me, but I know of you through Dog Habitat Rescue (where I work) and various animal postings. I know you are an animal lover, so I was hoping you could help me advertise a fundraiser for an animal organization called Animal Farm Foundation. They are a progressive animal rescue and advocacy organization, focusing on “pit bull” issues. They really do good work and are an inspiring and positive organization. Here’s their website. Our event is an Art Auction fundraiser, tomorrow (Thurs, July 26) from 7-10pm. We will have vegan snacks and beer and wine for free. The art work being donated is primarily from tattoo artists. We have some samples on our event page. Most of the artists are local and some from Philly as well. Some will be in attendance too. We would really appreciate it if you could mention this in your blog. And/or come!!! Animal Farm Foundation, Inc., a not-for-profit corporation, has been rescuing and re-homing animals, as well as making grants to other humane organizations, since the mid-1980’s. We are located in Dutchess County, NY. We currently dedicate our resources to securing equal treatment and opportunity for “pit bull” dogs. Whether the dog is called a “pit bull” because of a documented pedigree, or merely on the basis of physical appearance, recognizing that these dogs are individuals for whom we are responsible is an integral step toward a compassionate future for all dogs. When we started rescuing and rehoming dogs, we focused on American Pit Bull Terriers. Over time, we realized that the dogs we were helping were not necessarily pure bred American Pit Bull Terriers, but dogs that people called “pit bulls.” “Pit bull” is not a breed or breed mix, but an ever expanding group that includes whatever an animal control officer, shelter worker, dog trainer, politician, dog owner, police officer or newspaper says it is. This opened our eyes to the dogs in front of us. These are the dogs that need our help. I wholeheartedly agree. 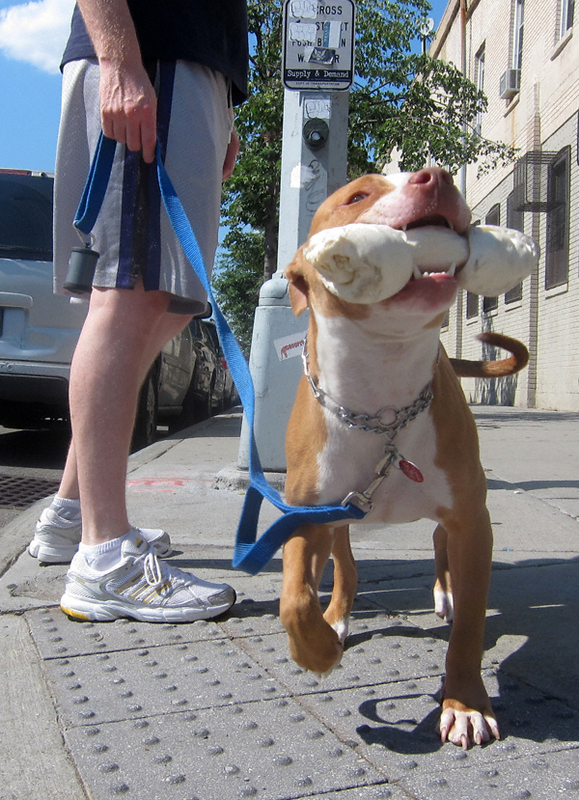 Inasmuch as our City Council’s Public Safety Chair, Peter Vallone, likes to make hay about the dangers posed by these pups, the reality is there are no bad dogs— only bad owners. Conversely, take the above fellow I encountered on Franklin Street earlier this week. His name is, appropriately enough, Petey. As you can see he is one happy (if slightly goofy) guy. He is quite loved. Wouldn’t it be nice if all his brothers and sisters had a reason to smile (like he does)? Check it out! July 16, 2012 (that’s today!) starting at 7:00 p.m. This item comes courtesy of my friend P.J. of Empty Cages Collective. 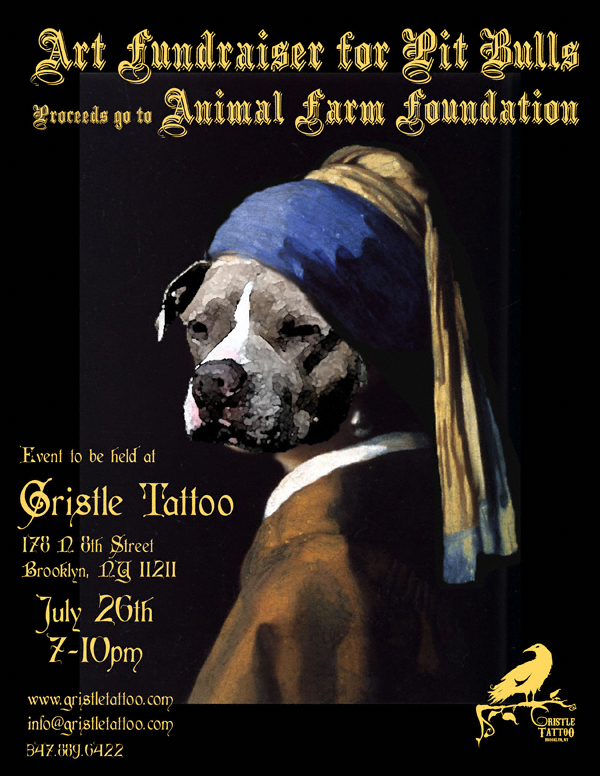 Today starting at noon the folks at Empty Cages will be conducting an adoption event/craft fair at Williamsburg’s own Gristle Tattoo. 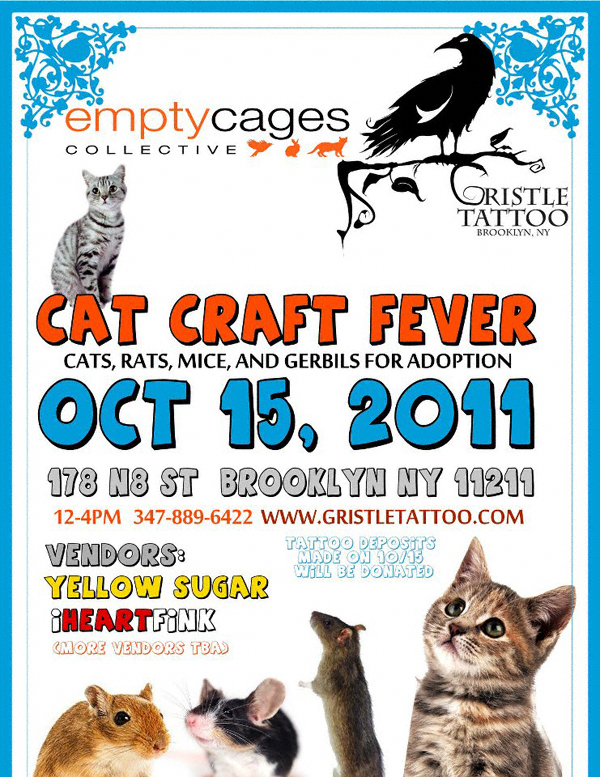 NOTE: as the flyer states all tattoo deposits made today will be donated to Empty Cages! Check it out! October 15, 2011 Noon – 4:00 p.m.